Black to live and keep all territory. 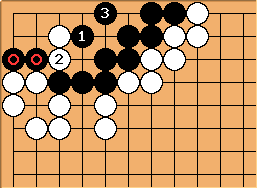 White can now capture the marked Black stones with . 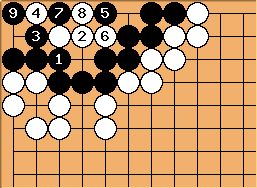 Black can indeed live with play at ... but the objective of winning the game is lost. 3 liberties vs 2 liberties! 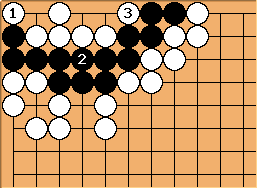 Black to play and live. No seki. Note that this is NOT a double ko seki that gives white an infinite number of ko threats. Even if White had a stone at S, Black can play either ko for endgame points; so this is not seki. In addition, A White approach at 'a' to attempt to kill Black results in self-atari. So Black doesn't need to force a win in the ko battle. This prevents White from using this situation as an infinite ko threat for a Ko elsewhere on the board. White is forced to play (else Black makes an easy two eyes). White's is forced (can't let Black make that other eye)! impu1se: I think this is right. 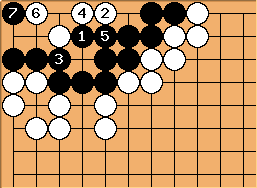 White must play to keep black from making an eye. Black will now live due to the double ko. 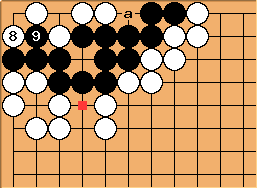 However, white has a nice source of ko threats. IlyaM: Yep, this is the correct solution. Fortunaly in my game where this position appeared it appeared very late in the game so there were no ko-fights. EricBackus: I'm missing something. At any given move, black will hold either the 'square' ko or the 'circle' ko, and white will hold the other. If White is allowed to take away Black's outside libery at 'c' and fill the inside liberty at 'd'; then this reduces to Double Ko Seki (right?) which we're told is a failure. To prevent this, black must take 'd'. But to do that requires winning a ko fight. It seems to me that black gets to choose between double-ko seki and a single-ko fight, and we're told that seki isn't good enough so this must be a single-ko fight. Is this really the best solution available to black? 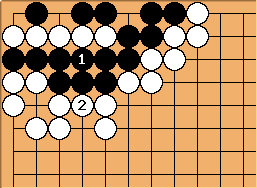 Bill: Black can still live in double ko. Bill: Through the result is seki. The Black move of 7 aims to be able to play at square next. The extra liberty on the outside at circle should put Black ahead in the ko fight. Can't squirm from the trap! White is a mistake. This leads to a ko fight for life. Hence Black still has a chance to win the game. Black can take the KO first here. White needs to find the first threat. EricBackus: Putting black in atari reduces this to a ko for life in the corner. So it's not life, it's ko, and thus a failure if unconditional life was possible? This looks like a seki to me. MrTenuki: Unfortunately, the method you've suggested probably wouldn't work without a quantum computer (the program gives me an estimated solving time of 199999953 seconds).